Thomson said removal of his project officers, stadia-in-charges and accounts officers will affect training. The director general of the Sports Authority of India, Jiji Thomson, has requested the chief electoral officer of Delhi to spare his officials who might be called up to assist during the Lok Sabha elections. In the past, the bulk of SAI staff, as government of India officials, have been called in to assist with election related work. Last year, during the Delhi assembly elections held in December 2013, 232 SAI personnel — including officers and secretarial staff — were deployed to help out in polling and other details. Fearing a similar number of officials would be forced to help out with the elections this time too, Thomson has written a letter to special chief electoral officer Shurbir Singh to spare his officers this time around. Instead, he has requested that only 88 staff members (the list with their contact numbers has been attached with the letter), who are mostly lower rung employees, be deployed in poll-related duties. 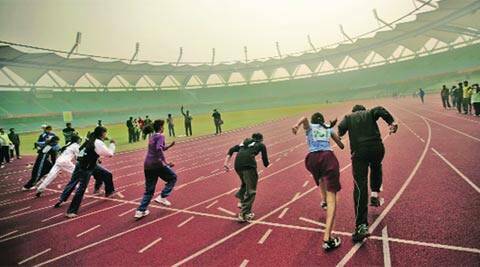 With the Commonwealth Games just 150 days away, Thomson said that the removal of his project officers, stadia-in-charges and accounts officers will affect the training of the Indian athletes, currently on-duty at various national camps. “We just cannot afford to lose momentum in training as we are left with less than 150 days for the Commonwealth Games. Even a temporary disruption will adversely affect the training schedule and, I am afraid, this would have a dampening effect on our medal hunt,” Thomson’s letter to Delhi’s chief electoral officer read. “I would be grateful if you could kindly consider this aspect while detailing the officers on poll duty,” Thomson added. When contacted, Thomson said that national camps were affected during last year’s Delhi Assembly polls too, when coaches were taken away for poll duties. “Suppose some of our accounts officers are called up, who will replace them? Payments have to be made and if for some reason the dietary supplements do not reach athletes because the payments weren’t made in time, what do you think will happen? Who will be blamed for not doing the job? “Also there are specialised jobs, where replacing people are impossible. No one can replace a video analyst if he is missing for poll duty. I cannot replace a stadia in-charge with a lesser officer,” he said. Thomson is worried on a different count too. At the moment, SAI is also compiling the Annual Calendar for Training and Competition (ACTC) for 2014-15 for all sporting disciplines. Disbursement of funds to these disciplines is a part of the discussions. The process has to finish before the end of March and if any of the project officers, who liaison between SAI and the federations, are called up for election duty, the planning process will be severely hit. “We have to finalise this (ACTC) as soon as we can. Both the Commonwealth Games and the Asian Games are near and any delay will hit our preparations,” Thomson added.